Christopher Isherwood. To most readers, the name conjures the world: the smoke-saturated bar, redolent with the sweat of young, grasping hustlers; the bohemian domesticity, symbolised in the splash of Worcestershire sauce sluicing into the prairie oyster; perhaps even Liza Minelli supine on a wooden chair, her black-heeled boots pointing high into the ceiling. This novelist will always be associated with the criminal and sexual underworld of the Weimar Republic, explored in his bestselling novels Mr Norris Changes Trains and Goodbye to Berlin. There exits another side to this elusive writer, however, a different train for Herr Issyvoo. From the Second World War to his death in 1986, Isherwood produced a prolific and highly experimental body of work: our collection stems from this corpus. 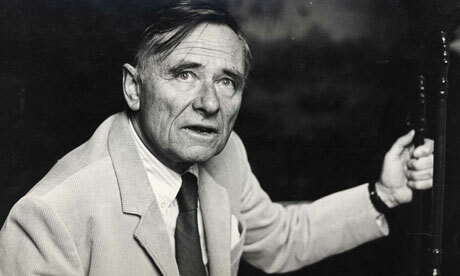 Instead of the charged, political works of his youth, the later Isherwood adopted a humorous, more contemplative tone. And, aside from these new stylistic ‘trains’, the sheer range of subject matter tackled is staggering. There are more sophisticated, more nuanced novels like A Single Man; there’s a wealth of perceptive literary criticism, collected in Exhumations; there’s The Condor and the Cows, a travel book detailing his wanderings around South American with his erstwhile lover, Bill Caskey; there’s even a biography of Ramakrishna, one of the holiest Hindu monks. One of the most intriguing works from this period—and, indeed, from our collection—is Christopher and His Kind, a memoir in which the Californian Isherwood takes on his younger, angrier self. The two trains collide, and from the wreckage Isherwood hoped to ‘de-fictionalise’ his Berlin life, to separate the reality from the Oscar-winning glamour of Cabaret. The wreckage provides the book’s most interesting literary device; Isherwood not only narrates the memoir in a conventional manner, but includes himself as a third-person character, referred to as ‘Christopher’. This dual-persona makes for a witty and gut-wrenchingly honest read. The author evokes the Berlin demimonde with a wit and precision that was somehow lacking the first time, and gives fascinating insights into his artistic process.